How To View Specific VTN Station Information. After setting up the apache tomcat server, what are the aspects that should be checked. OpenDaylight Virtual Tenant Network (VTN) is an application that provides multi-tenant virtual network on an SDN controller. Conventionally, huge investment in the network systems and operating expenses are needed because the network is configured as a silo for each department and system. So, various network appliances must be installed for each tenant and those boxes cannot be shared with others. It is a heavy work to design, implement and operate the entire complex network. The uniqueness of VTN is a logical abstraction plane. This enables the complete separation of logical plane from physical plane. Users can design and deploy any desired network without knowing the physical network topology or bandwidth restrictions. VTN allows the users to define the network with a look and feel of conventional L2/L3 network. Once the network is designed on VTN, it will automatically be mapped into underlying physical network, and then configured on the individual switch leveraging SDN control protocol. The definition of logical plane makes it possible not only to hide the complexity of the underlying network but also to better manage network resources. It achieves reducing reconfiguration time of network services and minimizing network configuration errors. An OpenDaylight Plugin that interacts with other modules to implement the components of the VTN model. It also provides a REST interface to configure VTN components in OpenDaylight. VTN Manager is implemented as one plugin to the OpenDaylight. This provides a REST interface to create/update/delete VTN components. The user command in VTN Coordinator is translated as REST API to VTN Manager by the OpenDaylight Driver component. In addition to the above mentioned role, it also provides an implementation to the OpenStack L2 Network Functions API. odl-vtn-manager provides VTN Manager’s JAVA API. odl-vtn-manager-rest provides VTN Manager’s REST API. 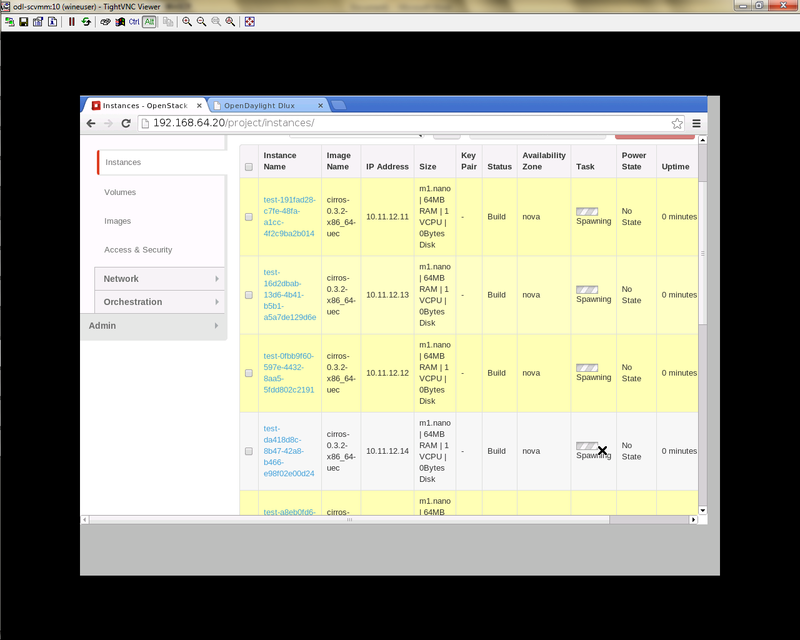 odl-vtn-manager-neutron provides the integration with Neutron interface. VTN Manager provides REST API for virtual network functions. 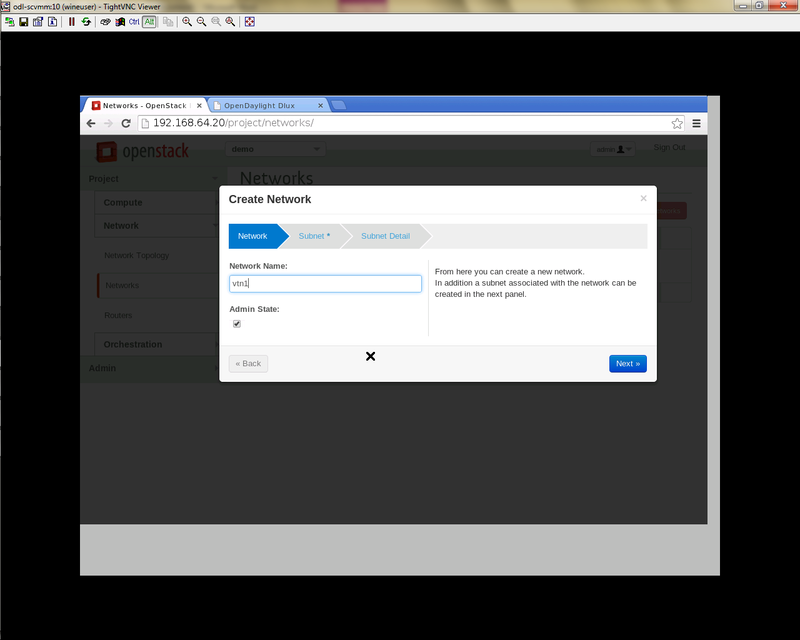 Here is an example of how to create a virtual tenant network. You can check the list of all tenants by executing the following command. The VTN Coordinator is an external application that provides a REST interface for an user to use OpenDaylight VTN Virtualization. It interacts with VTN Manager plugin to implement the user configuration. It is also capable of multiple OpenDaylight orchestration. It realizes Virtual Tenant Network (VTN) provisioning in OpenDaylight instances. In the OpenDaylight architecture VTN Coordinator is part of the network application, orchestration and services layer. VTN Coordinator will use the REST interface exposed by the VTN Manger to realize the virtual network using OpenDaylight. It uses OpenDaylight APIs (REST) to construct the virtual network in OpenDaylight instances. It provides REST APIs for northbound VTN applications and supports virtual networks spanning across multiple OpenDaylight by coordinating across OpenDaylight. The user first defines a VTN. Then, the user maps the VTN to a physical network, which enables communication to take place according to the VTN definition. With the VTN definition, L2 and L3 transfer functions and flow-based traffic control functions (filtering and redirect) are possible. The following table shows the elements which make up the VTN. In the VTN, a virtual network is constructed using virtual nodes (vBridge, vRouter) and virtual interfaces and links. 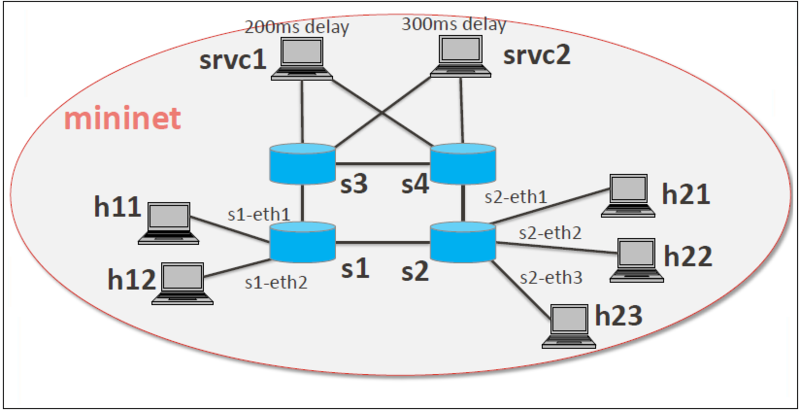 It is possible to configure a network which has L2 and L3 transfer function, by connecting the virtual intrefaces made on virtual nodes via virtual links. vBridge The logical representation of L2 switch function. vRouter The logical representation of router function. vTep The logical representation of Tunnel End Point - TEP. vTunnel The logical representation of Tunnel. vBypass The logical representation of connectivity between controlled networks. Virtual interface The representation of end point on the virtual node. Virtual Linkv(vLink) The logical representation of L1 connectivity between virtual interfaces. The following figure shows an example of a constructed virtual network. 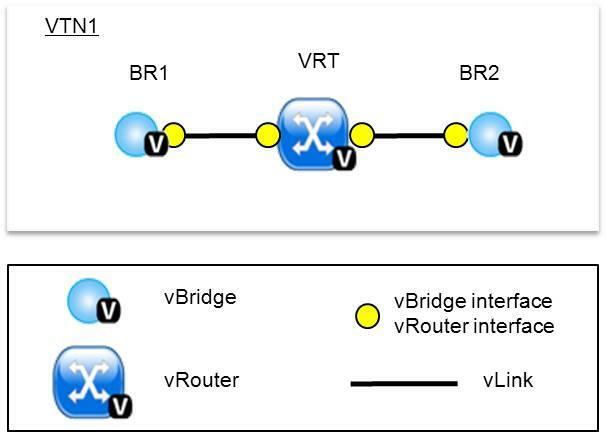 VRT is defined as the vRouter, BR1 and BR2 are defined as vBridges. interfaces of the vRouter and vBridges are connected using vLinks. Map physical network resources to the constructed virtual network. Mapping identifies which virtual network each packet transmitted or received by an OpenFlow switch belongs to, as well as which interface in the OpenFlow switch transmits or receives that packet. There are two mapping methods. When a packet is received from the OFS, port mapping is first searched for the corresponding mapping definition, then VLAN mapping is searched, and the packet is mapped to the relevant vBridge according to the first matching mapping. Port mapping Maps physical network resources to an interface of vBridge using Switch ID, Port ID and VLAN ID of the incoming L2 frame. Untagged frame mapping is also supported. VLAN mapping Maps physical network resources to a vBridge using VLAN ID of the incoming L2 frame.Maps physical resources of a particular switch to a vBridge using switch ID and VLAN ID of the incoming L2 frame. MAC mapping Maps physical resources to an interface of vBridge using MAC address of the incoming L2 frame(The initial contribution does not include this method). VTN can learn the terminal information from a terminal that is connected to a switch which is mapped to VTN. Further, it is possible to refer that terminal information on the VTN. Learning terminal information VTN learns the information of a terminal that belongs to VTN. It will store the MAC address and VLAN ID of the terminal in relation to the port of the switch. Aging of terminal information Terminal information, learned by the VTN, will be maintained until the packets from terminal keep flowing in VTN. If the terminal gets disconnected from the VTN, then the aging timer will start clicking and the terminal information will be maintained till timeout. The following figure shows an example of mapping. An interface of BR1 is mapped to port GBE0/1 of OFS1 using port mapping. Packets received from GBE0/1 of OFS1 are regarded as those from the corresponding interface of BR1. 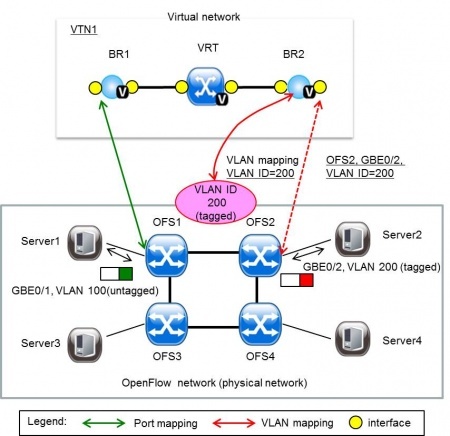 BR2 is mapped to VLAN 200 using VLAN mapping. Packets with VLAN tag 200 received from any ports of any OFSs are regarded as those from an interface of BR2. The vBridge provides the bridge function that transfers a packet to the intended virtual port according to the destination MAC address. The vBridge looks up the MAC address table and transmits the packet to the corresponding virtual interface when the destination MAC address has been learned. When the destination MAC address has not been learned, it transmits the packet to all virtual interfaces other than the receiving port (flooding). MAC addresses are learned as follows. MAC address learning The vBridge learns the MAC address of the connected host. The source MAC address of each received frame is mapped to the receiving virtual interface, and this MAC address is stored in the MAC address table created on a per-vBridge basis. MAC address aging The MAC address stored in the MAC address table is retained as long as the host returns the ARP reply. After the host is disconnected, the address is retained until the aging timer times out. To have the vBridge learn MAC addresses statically, you can register MAC addresses manually. The vRouter transfers IPv4 packets between vBridges. The vRouter supports routing, ARP learning, and ARP aging functions. The following outlines the functions. Routing function When an IP address is registered with a virtual interface of the vRouter, the default routing information for that interface is registered. It is also possible to statically register routing information for a virtual interface. ARP learning function The vRouter associates a destination IP address, MAC address and a virtual interface, based on an ARP request to its host or a reply packet for an ARP request, and maintains this information in an ARP table prepared for each routing domain. The registered ARP entry is retained until the aging timer, described later, times out. The vRouter transmits an ARP request on an individual aging timer basis and deletes the associated entry from the ARP table if no reply is returned. For static ARP learning, you can register ARP entry information manually. DHCP relay agent function The vRouter also provides the DHCP relay agent function. Flow Filter function is similar to ACL. It is possible to allow or prohibit communication with only certain kind of packets that meet a particular condition. Also, it can perform a processing called Redirection - WayPoint routing, which is different from the existing ACL. Flow Filter can be applied to any interface of a vNode within VTN, and it is possible to the control the packets that pass interface. The match conditions that could be specified in Flow Filter are as follows. It is also possible to specify a combination of multiple conditions. The types of Action that can be applied on packets that match the Flow Filter conditions are given in the following table. It is possible to make only those packets, which match a particular condition, to pass through a particular server by specifying Redirection in Action. E.g., path of flow can be changed for each packet sent from a particular terminal, depending upon the destination IP address. VLAN priority control and DSCP marking are also supported. Pass Pass particular packets matching the specified conditions. Drop Discards particular packets matching the specified conditions. Redirection Redirects the packet to a desired virtual interface. Both Transparent Redirection (not changing MAC address) and Router Redirection (changing MAC address) are supported. The following figure shows an example of how the flow filter function works. 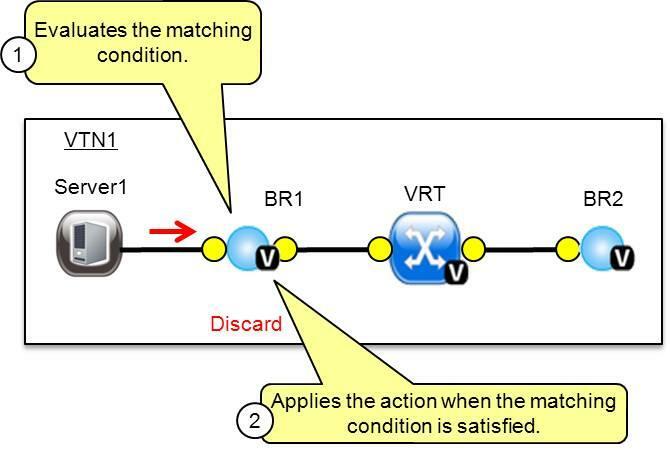 If there is any matching condition specified by flow filter when a packet being transferred within a virtual network goes through a virtual interface, the function evaluates the matching condition to see whether the packet matches it. If the packet matches the condition, the function applies the matching action specified by flow filter. In the example shown in the figure, the function evaluates the matching condition at BR1 and discards the packet if it matches the condition. With the network abstractions, VTN enables to configure virtual network across multiple SDN controllers. This provides highly scalable network system. 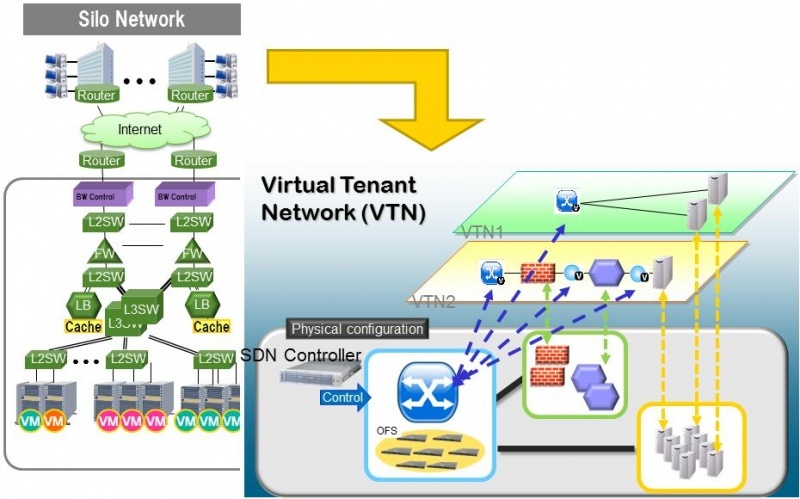 VTN can be created on each SDN controller. If users would like to manage those multiple VTNs with one policy, those VTNs can be integrated to a single VTN. As a use case, this feature is deployed to multi data center environment. Even if those data centers are geographically separated and controlled with different controllers, a single policy virtual network can be realized with VTN. Also, one can easily add a new SDN Controller to an existing VTN or delete a particular SDN Controller from VTN. In addition to this, one can define a VTN which covers both OpenFlow network and Overlay network at the same time. Flow Filter, which is set on the VTN, will be automatically applied on the newly added SDN Controller. It is possible to configure VTN on an environment where there is mix of L2/L3 switches as well. L2/L3 switch will be shown on VTN as vBypass. Flow Filter or policing cannot be configured for a vBypass. However, it is possible to treat it as a virtual node inside VTN. VTN provides Web APIs. They are implemented by REST architecture and provide the access to resources within VTN that are identified by URI. User can perform the operations like GET/PUT/POST/DELETE against the virtual network resources (e.g. vBridge or vRouter) by sending a message to VTN through HTTPS communication in XML or JSON format. VTN provides following operations for various network resources. The following is an example of the usage to construct a virtual network. 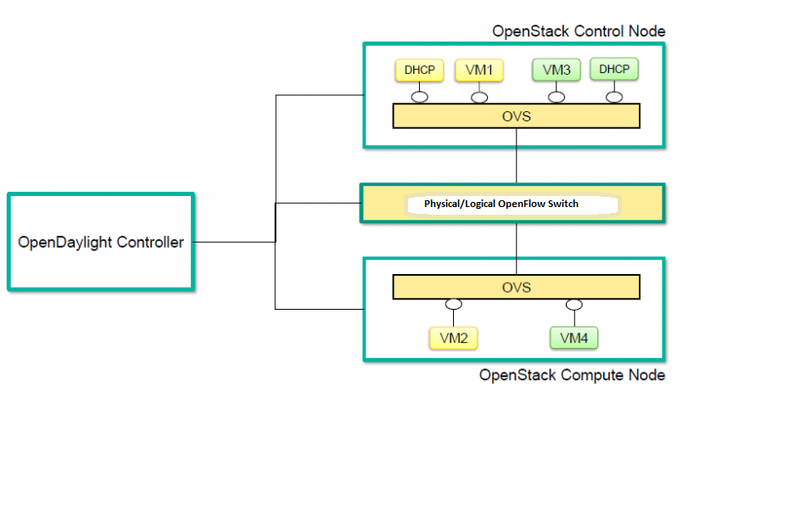 While OpenDaylight Controller provides several ways to integrate with OpenStack, this guide focus on the way which uses VTN features available on OpenDaylight. 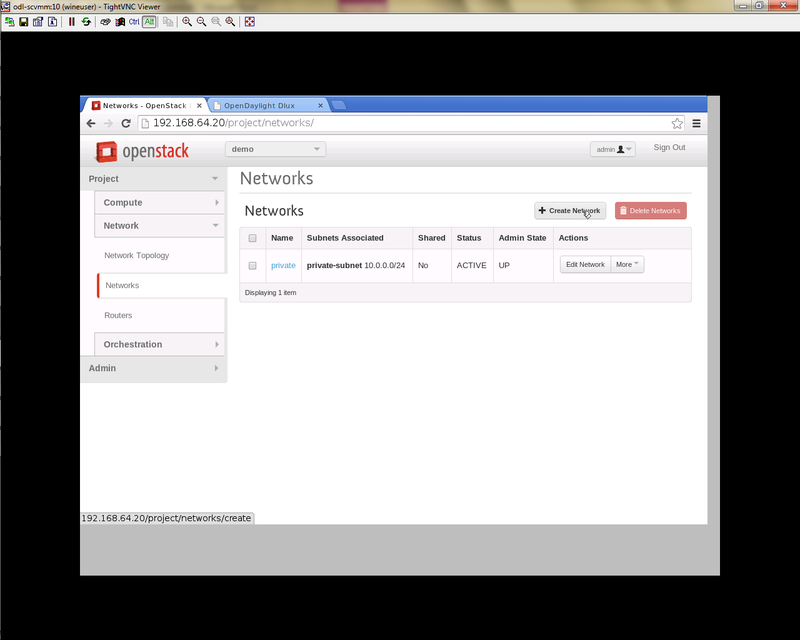 In the integration, VTN Manager work as network service provider for OpenStack. 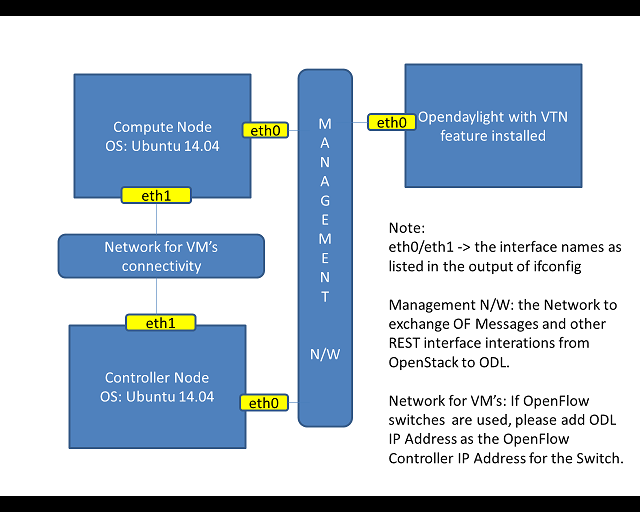 VTN Manager features, enable OpenStack to work in pure OpenFlow environment in which all switches in data plane are OpenFlow switch. OpenFlow Switch like mininet(Not Mandatory). 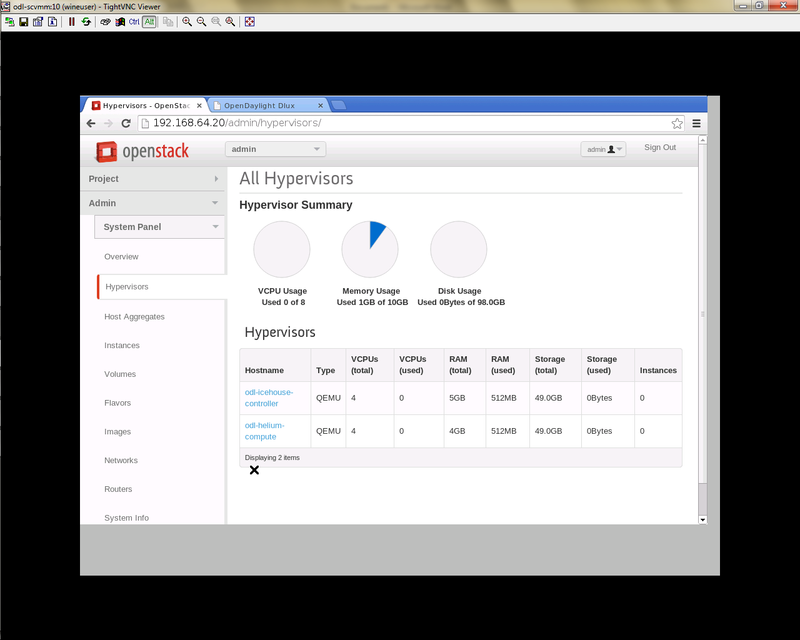 The VTN features support multiple OpenStack nodes. You can deploy multiple OpenStack Compute Nodes. In management plane, OpenDaylight Controller, OpenStack nodes and OpenFlow switches should communicate with each other. In data plane, Open vSwitches running in OpenStack nodes should communicate with each other through a physical or logical OpenFlow switches. The core OpenFlow switches are not mandatory. 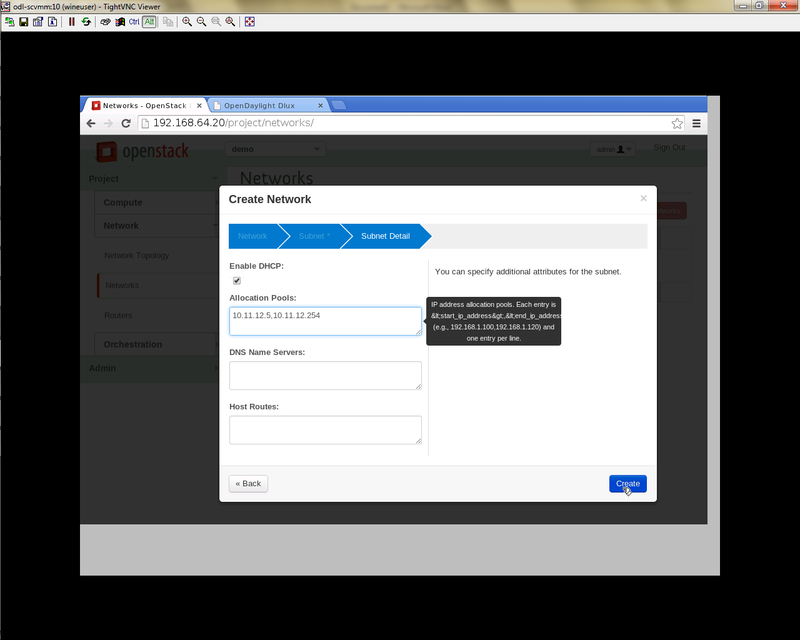 Therefore, you can directly connect to the Open vSwitch’s. 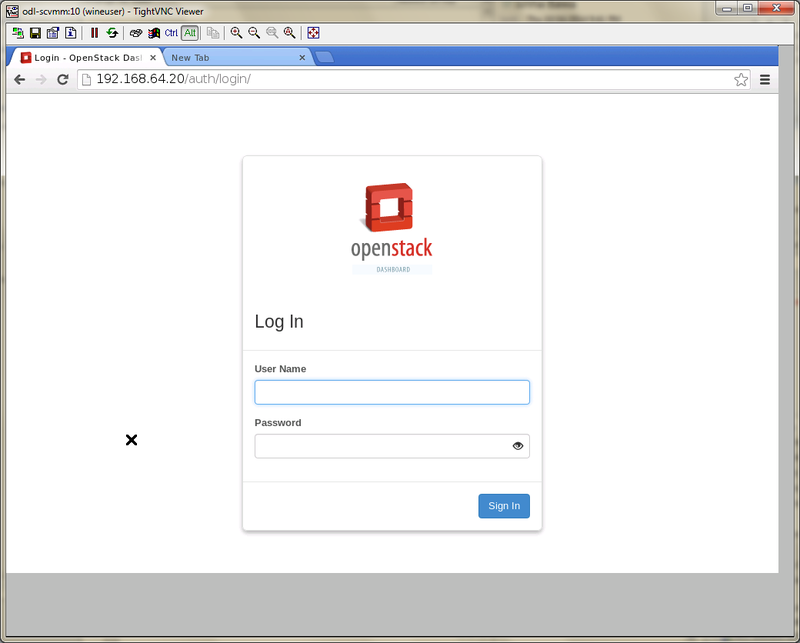 VTN uses the configuration parameters from “90-vtn-neutron.xml” file for the OpenStack integration. cd “distribution-karaf-0.5.0-Boron” and run karaf by using the following command “./bin/karaf”. Logout from the karaf console and Check “90-vtn-neutron.xml” file from the following path “distribution-karaf-0.5.0-Boron/etc/opendaylight/karaf/”. Especially, “portname” should be carefully configured, because if the value is wrong, OpenDaylight fails to forward packets. By default, if 90-vtn-neutron.xml is not created, VTN uses ens33 as portname. The value can be “standalone” or “secure”. Please use “secure” for general use cases. Copy the contents of local.conf for juno (devstack control node) from https://wiki.opendaylight.org/view/OpenDaylight_Virtual_Tenant_Network_(VTN):Scripts:devstack and save it as “local.conf” in the “devstack”. Copy the contents of local.conf for kilo and liberty (devstack control node) from https://wiki.opendaylight.org/view/OpenDaylight_Virtual_Tenant_Network_(VTN):Scripts:devstack_post_juno_versions and save it as “local.conf” in the “devstack”. Copy the contents of local.conf for juno (devstack compute node) from https://wiki.opendaylight.org/view/OpenDaylight_Virtual_Tenant_Network_(VTN):Scripts:devstack and save it as “local.conf” in the “devstack”. Copy the contents of local.conf file for kilo and liberty (devstack compute node) from https://wiki.opendaylight.org/view/OpenDaylight_Virtual_Tenant_Network_(VTN):Scripts:devstack_post_juno_versions and save it as “local.conf” in the “devstack”. Login to http://<CONTROL_NODE_IP>:8080/ to check the horizon GUI. Click on Launch Instances button. 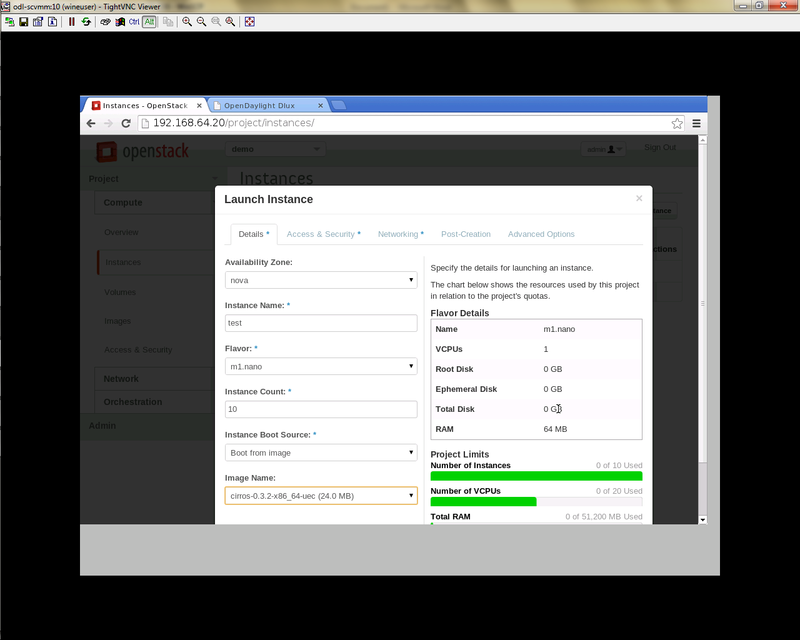 Click on Details tab to enter the VM details.For this demo we are creating Ten VM’s(instances). In the Networking tab, we must select the network,for this we need to drag and drop the Available networks to Selected Networks (i.e.,) Drag vtn1 we created from Available networks to Selected Networks and click Launch to create the instances. Ten VM’s will be created. Login to the VM console and verify with a ping command. Every time a new VM is created, more interfaces are added to the br-int bridge in Open vSwitch. Use sudo ovs-vsctl show to list the number of interfaces added. 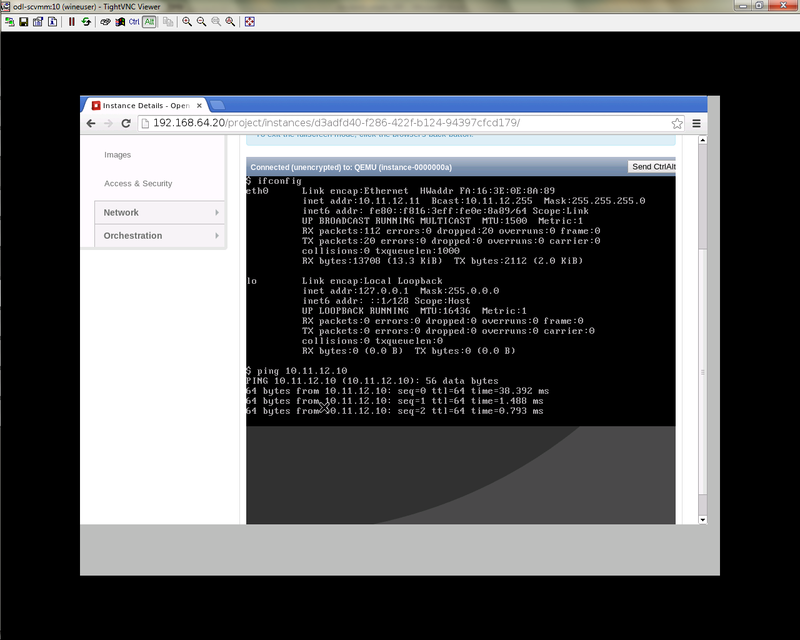 This page explains how to provision virtual L2 network using VTN Manager. This page targets Boron release, so the procedure described here does not work in other releases. Start Mininet and create three switches(s1, s2, and s3) and four hosts(h1, h2, h3, and h4) in it. Replace “192.168.0.100” with the IP address of OpenDaylight controller based on your environment. you can check the topology that you have created by executing “net” command in the Mininet console. In this guide, you will provision the virtual L2 network to establish communication between h1 and h3. To provision the virtual L2 network for the two hosts (h1 and h3), execute REST API provided by VTN Manager as follows. It uses curl command to call the REST API. Create a virtual tenant named vtn1 by executing the update-vtn RPC. Create a virtual bridge named vbr1 in the tenant vtn1 by executing the update-vbridge RPC. Create two interfaces into the virtual bridge by executing the update-vinterface RPC. Configure two mappings on the created interfaces by executing the set-port-map RPC. The interface if1 of the virtual bridge will be mapped to the port “s2-eth1” of the switch “openflow:2” of the Mininet. The h1 is connected to the port “s2-eth1”. The interface if2 of the virtual bridge will be mapped to the port “s3-eth1” of the switch “openflow:3” of the Mininet. The h3 is connected to the port “s3-eth1”. Please execute ping from h1 to h3 to verify if the virtual L2 network for h1 and h3 is provisioned successfully. You can also verify the configuration by executing the following REST API. It shows all configuration in VTN Manager. The result of the command should be like this. You can delete the virtual tenant vtn1 by executing the remove-vtn RPC. This page explains how to test Vlan-map in a multi host scenario using mininet. This page targets Boron release, so the procedure described here does not work in other releases. Save the mininet script given below as vlan_vtn_test.py and run the mininet script in the mininet environment where Mininet is installed. Replace “192.168.64.13” with the IP address of OpenDaylight controller based on your environment. To test vlan-map, execute REST API provided by VTN Manager as follows. Configure a vlan map with vlanid 200 for vBridge vbr1 by executing the add-vlan-map RPC. Create a virtual bridge named vbr2 in the tenant vtn1 by executing the update-vbridge RPC. 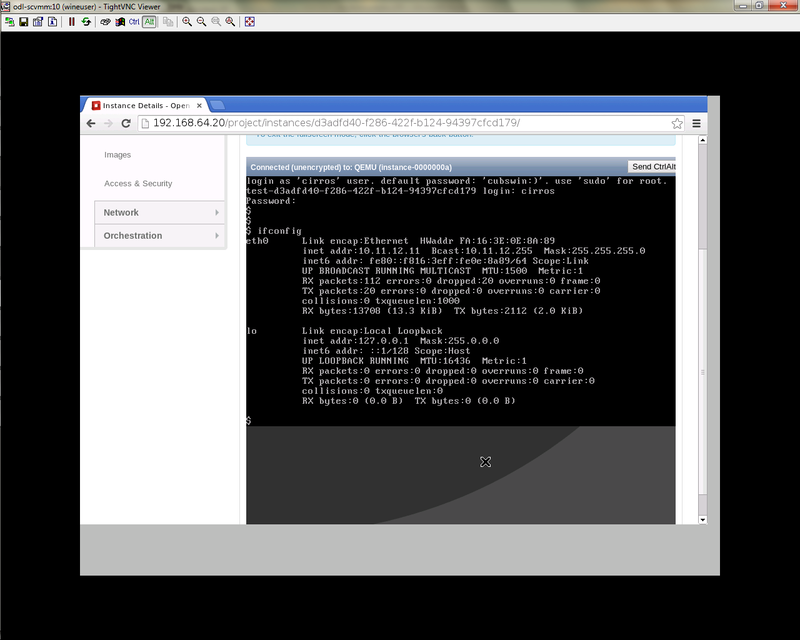 Configure a vlan map with vlanid 300 for vBridge vbr2 by executing the add-vlan-map RPC. Please execute pingall in mininet environment to view the host reachability. You can also verify the configuration by executing the following REST API. It shows all configurations in VTN Manager. 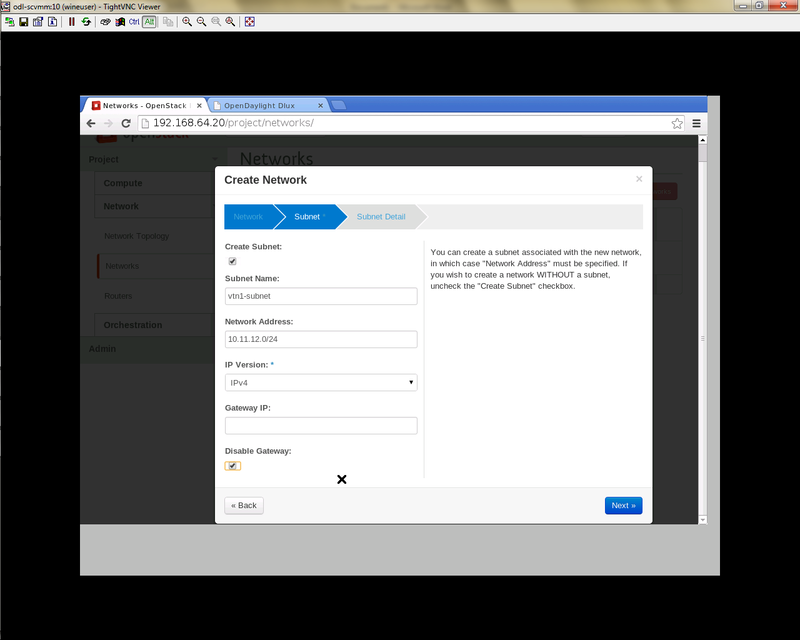 This page explains how to configure VTN Manager for Service Chaining. This page targets Boron release, so the procedure described here does not work in other releases. Please ensure Bridge-Utils package is installed in mininet environment before running the mininet script. To install Bridge-Utils package run sudo apt-get install bridge-utils (assuming Ubuntu is used to run mininet, If not then this is not required). Save the mininet script given below as topo_handson.py and run the mininet script in the mininet environment where Mininet is installed. Script for emulating network with multiple hosts. Before executing the mininet script, please confirm Controller is up and running. Please execute the following commands in the mininet console where mininet script is executed. The below commands are for the difference in behavior of Manager in Boron topology. The Link below has the details for this bug: https://bugs.opendaylight.org/show_bug.cgi?id=3818. Create interface if1 into the virtual bridge vbr1 by executing the update-vinterface RPC. Configure port mapping on the interface by executing the set-port-map RPC. The interface if1 of the virtual bridge will be mapped to the port “s1-eth2” of the switch “openflow:1” of the Mininet. The h12 is connected to the port “s1-eth2”. Create interface if2 into the virtual bridge vbr1 by executing the update-vinterface RPC. The interface if2 of the virtual bridge will be mapped to the port “s2-eth2” of the switch “openflow:2” of the Mininet. The h22 is connected to the port “s2-eth2”. Create interface if3 into the virtual bridge vbr1 by executing the update-vinterface RPC. Configure port mapping on the interfaces by executing the set-port-map RPC. The interface if3 of the virtual bridge will be mapped to the port “s2-eth3” of the switch “openflow:2” of the Mininet. The h23 is connected to the port “s2-eth3”. Create flowcondition named cond_1 by executing the set-flow-condition RPC. For option source and destination-network, get inet address of host h12(src) and h22(dst) from mininet. Flow filter demonstration with DROP action-type. Create Flowfilter in VBR Interface if1 by executing the set-flow-filter RPC. Create a virtual terminal named vt_srvc1_1 in the tenant vtn1 by executing the update-vterminal RPC. Create interface IF into the virtual terminal vt_srvc1_1 by executing the update-vinterface RPC. The interface IF of the virtual terminal will be mapped to the port “s3-eth3” of the switch “openflow:3” of the Mininet. The h12 is connected to the port “s3-eth3”. Create a virtual terminal named vt_srvc1_2 in the tenant vtn1 by executing the update-vterminal RPC. Create interface IF into the virtual terminal vt_srvc1_2 by executing the update-vinterface RPC. The interface IF of the virtual terminal will be mapped to the port “s4-eth3” of the switch “openflow:4” of the Mininet. The h22 is connected to the port “s4-eth3”. Create flowcondition named cond_any by executing the set-flow-condition RPC. Flow filter demonstration with redirect action-type. Create Flowfilter in virtual terminal vt_srvc1_2 interface IF by executing the set-flow-filter RPC. Flow filter demonstration with redirect action-type. Create Flowfilter in vbridge vbr1 interface if1 by executing the set-flow-filter RPC. Ping host12 to host22 to view the host rechability, a delay of 200ms will be taken to reach host22 as below. Please execute the below commands to configure the network topology which sends some specific traffic via two services(External device) in the controller as in the below image. Create a virtual terminal named vt_srvc2_1 in the tenant vtn1 by executing the update-vterminal RPC. Create interface IF into the virtual terminal vt_srvc2_1 by executing the update-vinterface RPC. The interface IF of the virtual terminal will be mapped to the port “s3-eth4” of the switch “openflow:3” of the Mininet. The host h12 is connected to the port “s3-eth4”. Create a virtual terminal named vt_srvc2_2 in the tenant vtn1 by executing the update-vterminal RPC. Create interfaces IF into the virtual terminal vt_srvc2_2 by executing the update-vinterface RPC. The interface IF of the virtual terminal will be mapped to the port “s4-eth4” of the switch “openflow:4” of the mininet. The host h22 is connected to the port “s4-eth4”. Flow filter demonstration with redirect action-type. Create Flowfilter in virtual terminal vt_srvc2_2 interface IF by executing the set-flow-filter RPC. Flow filter redirects vt_srvc2_2 to Bridge1-IF2. Flow filter redirects vt_srvc1_2 to vt_srvc2_1. Ping host12 to host22 to view the host rechability, a delay of 500ms will be taken to reach host22 as below. You can verify the configuration by executing the following REST API. It shows all configuration in VTN Manager. To clean up both VTN and flowconditions. You can delete the flowcondition cond_1 and cond_any by executing the remove-flow-condition RPC. This page explains how to view Dataflows using VTN Manager. This page targets Boron release, so the procedure described here does not work in other releases. Dataflow feature enables retrieval and display of data flows in the OpenFlow network. The data flows can be retrieved based on an OpenFlow switch or a switch port or a L2 source host. Location of virtual node which maps the incoming packet and outgoing packets. Location of physical switch port where incoming and outgoing packets is sent and received. A sequence of physical route info which represents the packet route in the physical network. To view Dataflow information, configure with VLAN Mapping https://wiki.opendaylight.org/view/VTN:Mananger:How_to_test_Vlan-map_using_mininet. After creating vlan mapping configuration from the above page, execute as below in mininet to get switch details. Please execute ping from h1 to h3 to check hosts reachability. Parallely execute below Restconf command to get data flow information of node “openflow:1” and its port “s1-eth1”. Get the Dataflows information by executing the get-data-flow RPC. This page demonstrates Mac Mapping. This demonstration aims at enabling communication between two hosts and denying communication of particular host by associating a Vbridge to the hosts and configuring Mac Mapping (mac address) to the Vbridge. This page targets Boron release, so the procedure described here does not work in other releases. Replace <path> and <Controller IP> based on your environment. To create Mac Map in VTN, execute REST API provided by VTN Manager as follows. It uses curl command to call REST API. Create a virtual tenant named Tenant1 by executing the update-vtn RPC. Create a virtual bridge named vBridge1 in the tenant Tenant1 by executing the update-vbridge RPC. Configuring Mac Mappings on the vBridge1 by giving the mac address of host h12 and host h22 as follows to allow the communication by executing the set-mac-map RPC. Mac Address of host h12 and host h22 can be obtained with the following command in mininet. MAC Mapping will not be activated just by configuring it, a two end communication needs to be established to activate Mac Mapping. Ping host h22 from host h12 in mininet, the ping will not happen between the hosts as only one way activation is enabled. Ping host h12 from host h22 in mininet, now the ping communication will take place as the two end communication is enabled. To view the configured Mac Map of allowed host execute the following command. When Deny is configured a broadcast message is sent to all the hosts connected to the vBridge, so a two end communication need not be establihed like allow, the hosts can communicate directly without any two way communication enabled. To Deny host h23 communication from hosts connected on vBridge1, the following configuration can be applied. You can delete the virtual tenant Tenant1 by executing the remove-vtn RPC. This page explains how to provision flowfilter using VTN Manager. This page targets Boron release, so the procedure described here does not work in other releases. Permits the packet to pass along the determined path. 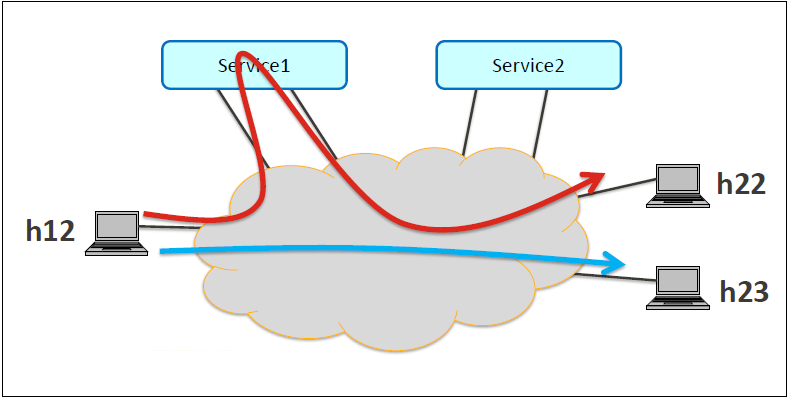 As options, packet transfer priority (set priority) and DSCP change (set ip-dscp) is specified. Redirects the packet to a desired virtual interface. As an option, it is possible to change the MAC address when the packet is transferred. when a packet is transferred to an interface within a virtual network, the flow-filter function evaluates whether the transferred packet matches the condition specifed in the flow-list. If the packet matches the condition, the flow-filter applies the flow-list matching action specified in the flow-filter. Specify where to apply the flow-filter, for example VTN, vBridge, or interface of vBridge. Start Mininet, and create three switches (s1, s2, and s3) and four hosts (h1, h2, h3 and h4) in it. In this guide, you will provision flowfilters to establish communication between h1 and h3. Configure two mappings on the interfaces by executing the set-port-map RPC. For option source and destination-network, get inet address of host h1 and h3 from mininet. Flowfilter can be applied either in VTN, VBR or VBR Interfaces. Here in this page we provision flowfilter with VBR Interface and demonstrate with action type drop and then pass. Update the flow filter to pass the packets by executing the set-flow-filter RPC. As we have applied action type PASS now ping should happen between hosts h1 and h3. You can also verify the configurations by executing the following REST API. It shows all configuration in VTN Manager. To clean up both VTN and flowcondition. You can delete the flowcondition cond_1 by executing the remove-flow-condition RPC. This page explains how to create specific VTN Pathmap using VTN Manager. This page targets Boron release, so the procedure described here does not work in other releases. Save the mininet script given below as pathmap_test.py and run the mininet script in the mininet environment where Mininet is installed. Replace “10.106.138.124” with the IP address of OpenDaylight controller based on your environment. Generate traffic by pinging between host h1 and host h2 before creating the portmaps respectively. To change the path of the packet flow, execute REST API provided by VTN Manager as follows. It uses curl command to call the REST API. The interface if1 of the virtual bridge will be mapped to the port “s2-eth1” of the switch “openflow:1” of the Mininet. The h1 is connected to the port “s1-eth1”. The h3 is connected to the port “s3-eth3”. Genarate traffic by pinging between host h1 and host h2 after creating the portmaps respectively. Create pathmap with flowcondition cond_1 by executing the set-path-map RPC. Create pathpolicy by executing the set-path-policy RPC. Before applying Path policy get node information by executing get dataflow command. After applying Path policy get node information by executing get dataflow command. Create a Controller named controllerone and mention its ip-address in the below create-controller command. Create a vBridge named vBridge1 in the vtn1 by executing the create-vbr command. Configure two mappings on each of the interfaces by executing the below command. The interface if1 of the virtual bridge will be mapped to the port “s2-eth1” of the switch “openflow:2” of the Mininet. The h1 is connected to the port “s2-eth1”. The interface if2 of the virtual bridge will be mapped to the port “s3-eth1” of the switch “openflow:3” of the Mininet. The h3 is connected to the port “s3-eth1”. Please verify whether the Host1 and Host3 are pinging. This example provides the procedure to demonstrate configuration of VTN Coordinator with L2 network using VTN Virtualization Here is the Example for vBridge Interface Mapping with Multi-controller using mininet. Create two Controllers named odc1 and odc2 with its ip-address in the below create-controller command. Create two Interfaces if1, if2 for the two vBridges vbr1 and vbr2. The interface if1 of the vbr1 will be mapped to the port “s2-eth2” of the switch “openflow:2” of the Mininet. The h2 is connected to the port “s2-eth2”. The interface if2 of the vbr2 will be mapped to the port “s5-eth2” of the switch “openflow:5” of the Mininet. The h6 is connected to the port “s5-eth2”. Please verify whether Host h2 and Host h6 are pinging. PING 10.0.0.6 (10.0.0.3) 56(84) bytes of data. 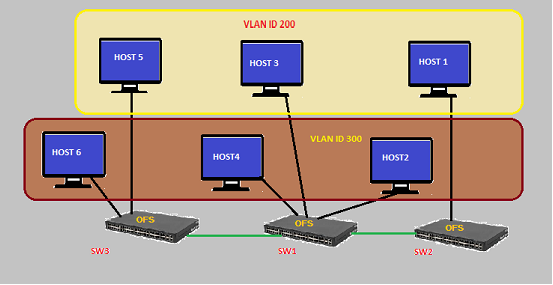 This example explains how to test vlan-map in a multi host scenario. Create a vBridge named vBridge2 in the vtn1 by executing the create-vbr command. Ping all in mininet environment to view the host reachability. This example demonstrates on how to view a specific VTN Station information. The interface if1 of the virtual bridge will be mapped to the port “s1-eth1” of the switch “openflow:1” of the Mininet. The h1 is connected to the port “s1-eth1”. The interface if2 of the virtual bridge will be mapped to the port “s1-eth2” of the switch “openflow:1” of the Mininet. The h2 is connected to the port “s1-eth2”. curl -X GET -H 'content-type: application/json' -H 'username: admin' -H 'password: adminpass' "http://127.0.0.1:8083/vtn-webapi/vtnstations?controller_id=controllerone&vtn_name=vtn1"
This example demonstrates on how to view a specific VTN Dataflow information. curl -X GET -H 'content-type: application/json' --user 'admin:adminpass' "http://127.0.0.1:8083/vtn-webapi/dataflows?controller_id=controllerone&srcmacaddr=924c.e4a3.a743&vlan_id=300&switch_id=openflow:2&port_name=s2-eth1"
Pass Permits the packet to pass. As options, packet transfer priority (set priority) and DSCP change (se t ip-dscp) is specified. Redirect Redirects the packet to a desired virtual interface. As an option, it is possible to change the MAC address when the packet is transferred. When a packet is transferred to an interface within a virtual network, the flow-filter function evaluates whether the transferred packet matches the condition specified in the flow-list. Create a flow-list and flow-listentry. Create a Controller named controller1 and mention its ip-address in the below create-controller command. Create a vBridge named vbr_two in the vtn1 by executing the create-vbr command. As we have applied the action type “drop” , ping should fail. This example demonstrates on how to create a specific VTN Path Map information. The interface if2 of the virtual bridge will be mapped to the port “s3-eth3” of the switch “openflow:3” of the Mininet. The h2 is connected to the port “s3-eth3”. curl -X GET -H 'content-type: application/json' --user 'admin:adminpass' "http://127.0.0.1:8083/vtn-webapi/dataflows?&switch_id=00:00:00:00:00:00:00:01&port_name=s1-eth1&controller_id=odc&srcmacaddr=de3d.7dec.e4d2&no_vlan_id=true"
(The flowconditions, pathmap and pathpolicy commands have to be executed in the controller). VTN Coordinator orchestrates multiple VTN Managers running in OpenDaylight Controllers, and provides VTN Applications with VTN API. VTN Manager is OSGi bundles running in OpenDaylight Controller. Current VTN Manager supports only OpenFlow switches. It handles PACKET_IN messages, sends PACKET_OUT messages, manages host information, and installs flow entries into OpenFlow switches to provide VTN Coordinator with virtual network functions. The requirements for installing these two are different.Therefore, we recommend that you install VTN Manager and VTN Coordinator in different machines. After executing db_setup, you have encountered the error “Failed to setup database”? 2. In case of Ubuntu, check if /usr/lib/postgres/<version> directory is present and check for the commands as in the previous step. Please check df -k and ensure enough free space is available. /usr/local/vtn/var/dbm/unc_setup_db.log for the exact error. Run the below command ensure the Coordinator daemons are running. Issue the curl command to fetch version and ensure the process is able to respond. How to debug a startup failure?. Database server is started after setting virtual memory to required value,Any database startup errors will be reflected in any of the below logs. uncd daemon is kicked off, The daemon in turn kicks off the rest of the daemons. Any  uncd startup failures will be reflected in /usr/local/vtn/var/uncd/uncd_start.err. Please check if catalina is running.. If you encounter an erroneous situation where the REST API is always failing.. Please ensure the firewall settings for port:8181 (Beryllium release) or port:8083 (Post Beryllium release) and enable the same. How to debug a REST API returning a failure message?. Please check the /usr/share/java/apache-tomcat-7.0.39/logs/core/core.log for failure details. REST API for VTN configuration fails, how to debug?. After setting the log levels, the operation can be repeated and the log files can be referred for debugging. Problems while Installing PostgreSQL due to openssl. For other linux platforms, Please do yum update, the public respositroes will have the latest openssl, please install the same. System Center Virtual Machine Manager (SCVMM) is Microsoft’s virtual machine support center for window’s based emulations. SCVMM is a management solution for the virtualized data center. You can use it to configure and manage your virtualization host, networking, and storage resources in order to create and deploy virtual machines and services to private clouds that you have created. The VSEM Provider is a plug-in to bridge between SCVMM and OpenDaylight. Microsoft Hyper-V is a server virtualization developed by Microsoft, which provides virtualization services through hypervisor-based emulations. A SCVMM with VSEM Provider installed and a running VTN Coordinator and OpenDaylight with VTN Feature installed. 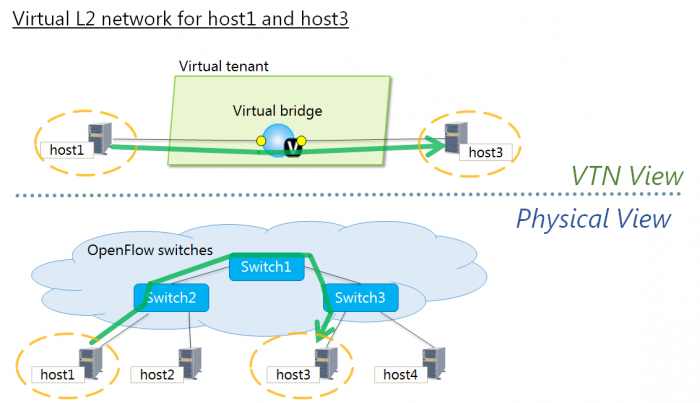 PF1000 virtual switch extension has been installed in the two Hyper-V servers as it implements the OpenFlow capability in Hyper-V.
Three OpenFlow switches simulated using mininet and connected to Hyper-V.
Four VM’s hosted using SCVMM. OpenDaylight VTN as Network Service provider for SCVMM where VSEM provider is added in the Network Service which will handle all requests from SCVMM and communicate with the VTN Coordinator. It is used to manage the network virtualization provided by OpenDaylight. System Center Virtual Machine Manager (SCVMM) supports only https protocol. Enter the command “yum install apr” in VTN Coordinator installed machine. In /usr/bin, create a soft link as “ln –s /usr/bin/apr-1-config /usr/bin/apr-config”. Extract tomcat under “/usr/share/java” by using the below command “tar -xvf apache-tomcat-8.0.27.tar.gz –C /usr/share/java”. Please go to the directory “cd /usr/share/java/apache-tomcat-8.0.27/bin and unzip tomcat-native.gz using this command “tar -xvf tomcat-native.gz”. Go to the directory “cd /usr/share/java/apache-tomcat-8.0.27/bin/tomcat-native-1.1.33-src/jni/native”. Enter the command “./configure –with-os-type=bin –with-apr=/usr/bin/apr-config”. Enter the command “make” and “make install”. Apr libraries are successfully installed in “/usr/local/apr/lib”. Enter the command “firewall-cmd –zone=public –add-port=8083/tcp –permanent” and “firewall-cmd –reload” to enable firewall settings in server. Execute the following command “openssl req -x509 -days 365 -extensions v3_ca -newkey rsa:2048 –out /etc/pki/CA/cacert.pem –keyout /etc/pki/CA/private/cakey.pem” in a single line. Specify the state or province. Organization Name Specify the company. Organizational Unit Name Specify the department, division, or the like. Common Name Specify the host name. Email Address Specify the e-mail address. Execute the following commands: “touch /etc/pki/CA/index.txt” and “echo 00 > /etc/pki/CA/serial” in server after setting your CA’s private key. Execute the following command “openssl req -new -newkey rsa:2048 -out csr.pem –keyout /usr/local/vtn/tomcat/conf/key.pem” in a single line. Enter the PEM pass phrase: Same password you have given in CA’s private key PEM pass phrase. A challenge password Specify the challenge password. An optional company name Specify an optional company name. Execute the following command “openssl ca –in csr.pem –out /usr/local/vtn/tomcat/conf/cert.pem –days 365 –batch” in a single line. Enter pass phrase for /etc/pki/CA/private/cakey.pem: Same password you have given in CA’s private key PEM pass phrase. Open the tomcat file using “vim /usr/local/vtn/tomcat/bin/tomcat”. Include the line ” TOMCAT_PROPS=”$TOMCAT_PROPS -Djava.library.path="/usr/local/apr/lib"” ” in 131th line and save the file. Open the server.xml file using “vim /usr/local/vtn/tomcat/conf/server.xml” and add the below lines. To stop vtn use the following command. To start vtn use the following command. Unzip the vtnmanager-vsemprovider-1.2.0-Boron-bin.zip file anywhere in your SCVMM machine. Stop SCVMM service from “service manager→tools→servers→select system center virtual machine manager” and click stop. Go to “C:/Program Files” in your SCVMM machine. Inside “C:/Program Files”, create a folder named as “ODLProvider”. Inside “C:/Program Files/ODLProvider”, create a folder named as “Module” in your SCVMM machine. Inside “C:/Program Files/ODLProvider/Module”, Create two folders named as “Odl.VSEMProvider” and “VSEMOdlUI” in your SCVMM machine. Copy the “VSEMOdl.dll” file from “ODL_SCVMM_PROVIDER/ODL_VSEM_PROVIDER” to “C:/Program Files/ODLProvider/Module/Odl.VSEMProvider” in your SCVMM machine. Copy the “VSEMOdlProvider.psd1” file from “application/vsemprovider/VSEMOdlProvider/VSEMOdlProvider.psd1” to “C:/Program Files/ODLProvider/Module/Odl.VSEMProvider” in your SCVMM machine. Copy the “VSEMOdlUI.dll” file from “ODL_SCVMM_PROVIDER/ODL_VSEM_PROVIDER_UI” to “C:/Program Files/ODLProvider/Module/VSEMOdlUI” in your SCVMM machine. Copy the “VSEMOdlUI.psd1” file from “application/vsemprovider/VSEMOdlUI” to “C:/Program Files/ODLProvider/Module/VSEMOdlUI” in your SCVMM machine. Copy the “reg_entry.reg” file from “ODL_SCVMM_PROVIDER/Register_settings” to your SCVMM desktop and double click the “reg_entry.reg” file to install registry entry in your SCVMM machine. Download “PF1000.msi” from this link, https://www.pf-info.com/License/en/index.php?url=index/index_non_buyer and place into “C:/Program Files/Switch Extension Drivers” in your SCVMM machine. Start SCVMM service from “service manager→tools→servers→select system center virtual machine manager” and click start. A single Hyper-V can host a number of virtual machines. If the host were to fail then all of the virtual machines that are running on it will also fail, thereby resulting in a major outage. Failover clustering treats individual virtual machines as clustered resources. If a host were to fail then clustered virtual machines are able to fail over to a different Hyper-V server where they can continue to run.